How would you like to spread Napalm on your face while releasing questionable propellants into the ozone layer, and then put a stack of eternal plastic into a landfill? Doesn’t sound like something you’d want to do does it? And yet if you use aerosol shaving gel, it contains the very same naptha and palm oil as Napalm, that cruel and unusual weapon used in the flame throwers of wars past. This is palm oil that comes from plantations that are gobbling up the habitats of endangered orangutans. And this convenient chemical cocktail is being helped out of the pressurized, plastic lined can by a propellant gas, which in many countries still contains ozone-eating CFC compounds. 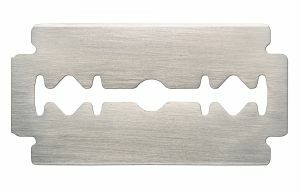 The 2, 3, 4 or 5.5 tiny blades on your razor cartridge are surrounded by, and packed and wrapped in, ounces and ounces of disposable plastic also. Surely this is not necessary? Of course it’s not! Just ask your father or perhaps your grandfather. A good shaving brush and some shaving soap can give you a better lather than anything in an aerosol can, for a fraction of the price, and with zero waste. And used properly, a double-edged safety razor, made entirely of steel will give you a close enough shave without irritation or cuts, and that razor blade contains no plastic. It’s all steel. While most come in a plastic box complete with a disposal slot in the back, you can easily find them individually wrapped in paper and then packed into a paper box of 100. Zero plastic. So if you think you are going green but still use Edge gel and a Fusion razor, think again Mister. It’s time to get into responsible shaving, while saving the planet, and also saving my friends the orangutans, (who never shave). Jeffrey the Barak shaves….often and repeatedly. Now you make me feel guilty when I shave. Maybe hard to believe, but in last 4 years I have not been able to find a “shaving stick” (solid lather) where I live, to use with my shaving brush, so I had no alternative but to use gel and plastic razors. The gel is green and I wish I never needed to shave..like our friends the orangutans. Hey Louis the Scooterer. Somewhere in your import-phobic country there must be either some mug soap or a tube of cream. You have one of the biggest razor blade factories outside of India so there must be some non-aerosol soap to go with all those Personna blades. Ask a local barber to guide you. Or what about Dead Sea Cosmetics Premier Shaving Gel in a tube. It’s a plastic tube, but it’s still better than Napalm. Way back I used a shaving stick about 1 1/2 inches diameter and about 3 inches long..smelled nice and gave a great foam with my brush, and seemed to last forever. I did in fact keep it inside a small mug. Not one salesperson (here) has ever seen this, and many havent a clue as to what it is. I will have another look at Ahava factory/shop at the Dead Sea..but remain resigned that I will never see one again. I will gladly accept a gift of such a stick from anyone planning to visit. On another subject.. Also way back, I owned a business called “MUG”. Just Google “shaving stick”, pick one that costs $6, buy three of them and have them shipped to Israel and pay the duty. It won’t break the bank. You are an Internet legend, so use it to buy something. Or go and ask the local barber where you can get a stick or some cream or mug soap. It may be within scooting distance! Wow, I never thought about Google, and yes they certainly have a wide range..amazing what I learn from “comments”. The several barbers that I’ve “visited” are able to speak 69, er, um, or is it 96 languages and most have never had the need to speak English. Maybe I’ll simply stop shaving and scoot with the orangutans.